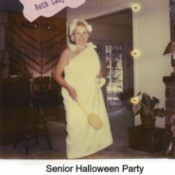 This page contains tips and ideas for making your own adult Halloween costumes. Bath Lady CostumeI sewed two large bath towels together, made a knot over one shoulder and secured with rubber band (wore a strapless top under it), used quilt batting to make soap bubbles attached to double faced tape & pasted on arms & face, and shower cap with soap bubbles also and carried a bath brush and soap on rope and wore flip flops. 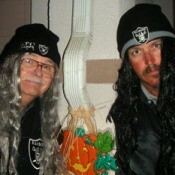 Raider Fans CostumesThis Halloween my husband and father-in-law were . . . Comic Book Couple for HalloweenHere is a photo of my husband and I this Halloween. 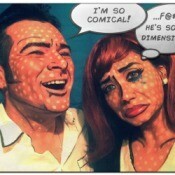 I turned us into cheeky comic book characters. It all cost a few dollars using just makeup, markers (for outlining old clothes), and paper for talk bubbles. Halloween Costume HelpWe are having a halloween costume contest at my work and have to do a theme for our department. 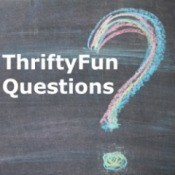 However, we are having a little trouble coming up with an original idea for 5 girls and 1 guy. Making a Leather MaskI'm making a leather mask for a Halloween masked ball and I'm going to soak it and let it air dry, so it hardens and retains its shape. I already have paper pieces cut out for the parts, but I want to know how much the leather will shrink before I stitch all the leather together. Making M&M Character Costumes for AdultsI'm trying to make M&M character costumes for adults. I have to make 20 for my group. Where can I find that foamy material? Simple Halloween Costumes for an Office GroupI am looking for a super easy idea for office Halloween costumes for a group of 6 or 7 people. Last year we all dressed as usual and carried signs saying "Nudists on Strike!". I am looking for something simple like that. Anyone? 3 Sheets to the Wind CostumeI want to dress up as 3 sheets to the wind for Halloween with my 2 other friends. What would be a good way to do that? Unique Group Halloween Costume Ideas For WorkI work for a credit union and we need help thinking of a unique Halloween costumes for a group contest.